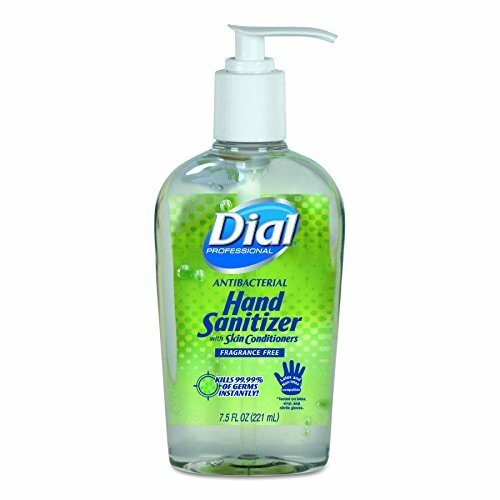 Dial Professional hand sanitizer, 7.5 oz. pump bottle, helps reduce the number of germs on hands, is dispensed at the push of a pump, and contains moisturizers to help keep skin hydrated. It is effective against bacteria, yeast, and molds, and is free of fragrances and dyes. Hand sanitizers (also called hand antiseptics) are liquids, gels, or foams that help reduce the number of germs on hands when a small amount is rubbed into the skin; no rinsing with water or drying with towels is needed. In situations when soap and water are not available, the U.S. Centers for Disease Control and Prevention (CDC) recommends use of an alcohol-based hand sanitizer that contains at least 60% alcohol. Alcohol-based hand sanitizers can quickly reduce the number of germs on hands, but do not eliminate every kind of pathogenic microorganism. Hand sanitizers are not as effective when hands are visibly dirty. They are available in a range of sizes, from small bottles for personal use to large mounted dispensers for public or institutional use. They are also available as wipes: small, disposable paper or nonwoven towels soaked in a hand sanitizer liquid. Hand sanitizers are typically part of hand hygiene programs at health care and food processing facilities, where pathogenic microorganisms are common.